“We always do that!” Why Family Tradition is Important! Our “traditional” Christmas tree. 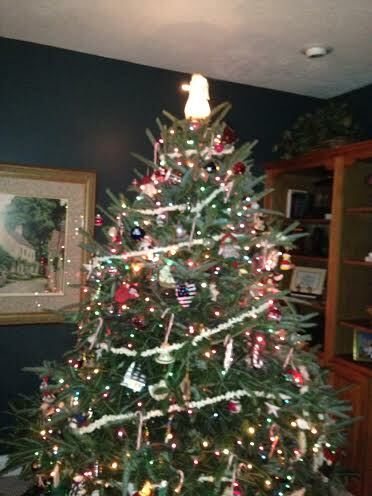 A little more “perfectly” decorated than years past….there are ornaments even on the bottom of the tree now! If we are smart we listen to our children when they say “That is how we always do it!” or “That is what we always do!” even when we have only done it that way one other time. Your child is not just talking about the good time he had, but the fact that it meant something to him and he thinks to you too. One of my favorite quotes is from the book The Little Prince by Antoine de Saint-Exupéry, “We live not by things, but the meaning of things.” It is not what you do or eat that is important, it is the meaning and feeling that comes with what you are doing that is so important to your child. There are 3 important “pillars” in a family, our family values, our family norms, and our family rituals and traditions. If we don’t take time to develop each of these pillars….we usually will run on a “default” mode of doing what is easy at the time. Being intentional as a family is very important. Values… what is most important to your family. Values are what you want as a parent to pass to your children. For some these values may center around Religion, or the value of education, or the value of respect and kindness, or the value of taking care of our earth. In order for a value to become engrained in your child there must be norms or “rules and rituals” that follow these values. If Religion is a value, your family will attend church together, participate in family prayer, and become involved in activities which reflect your beliefs. If education is a value, your family might read together, limit screen time and have rules regarding homework and effort in school. If kindness and respect are values, your family may have norms or rules about conflict resolution, sharing, and rules around words that are spoken. Traditions and rituals are very intentional. These are family activities that have a purpose or meaning behind them and support your family values. Some are simply daily rituals, like bedtime routines and family dinners. Some are weekly rituals like Friday pizza nights or movie nights. Some occur with the season or with family milestones like the traditions of the holidays or 1st day of school pictures. The daily, weekly, and seasonal rituals and traditions tell your child what is important to your family. Creating your own special rituals and traditions now and repeating them throughout your child’s life will help during periods of stress in a family. Faithfully repeating these rituals and traditions helps a child feel secure, provides stability, and a sense of pride and belonging to your family. Even during a family crises, the fact that a bedtime ritual or a Christmas celebration looks somewhat the same brings a sense of security and stability to a child. 1. Traditions help make life predictable. Rituals that are followed daily, weekly, and yearly such as family dinners, nightly stories, spring picnics; holiday songs etc. helps make children feel secure. Their world is often unpredictable—keeping things predictable at home gives security. 2. Traditions give families a time to connect. Sometimes we can feel unconnected when we get busy. Family meals, stories, game nights etc. help us reconnect and start talking. Soon we know what is going on in our children’s lives. 3. Family traditions teach children family values. Service work, religious ceremonies, concern for the environment and many other values can be established through family traditions and rituals. These are values that when they are reinforced with traditional activities, your child will bring them with him to adulthood. 4. Traditions form a family identity. Build a family group for your child to feel connected to and this will often prevent them from trying to find other less suitable groups to identify with. A child’s family is a huge piece of their identity. Traditions and rituals can be very simple…it is the act of repeating them, allowing them to change with your family’s “season in life” and keeping them fun that is the key. If something is not fun anymore, then let it go! Don’t get hung up on creating the perfect rituals, let them happen naturally based on what your family enjoys. Many rituals and traditions just happen. The wonderful thing about becoming your own family is that you have the opportunity to create your own traditions and rituals from scratch. Some you will come up with on your own, some you will borrow, and some you will discard from your past, but the traditions you repeat will become part of who your unique family is. Take a drive in pajamas to see the holiday lights. Take a hike in a local park and find some natural decorations for your tree or to make other holiday decorations. Make a homemade Christmas tree ornament. Date it, and each year you will add to the collection. Bake Christmas cookies or Hanukkah treats and share with friends and neighbors. Draw Secret Santas in the family. Each Secret Santa will complete a kind deed for the family member he or she drew. Have a traditional Christmas breakfast, or Christmas Eve dinner. Lay a piece of straw in the Baby Jesus’ bed each day if a child has done a good deed. Read a holiday story each night. Have a traditional Advent wreath or Advent calendar. Have a Christmas countdown chain. Make a construction paper chain and tear one link off each day until Christmas. Write an activity on each chain link that you will do that day. Camp out under your Christmas tree one night. Make a birthday cake for Jesus. String popcorn for your tree. And the list can go on and on….share some of your favorite traditions and rituals! ← Keeping the Fun in the Holidays, and the Stress Out!